Today I'm showing you a vampire bride look, quite similar to the makeup I painted on my friend and I's faces for Halloween last year. 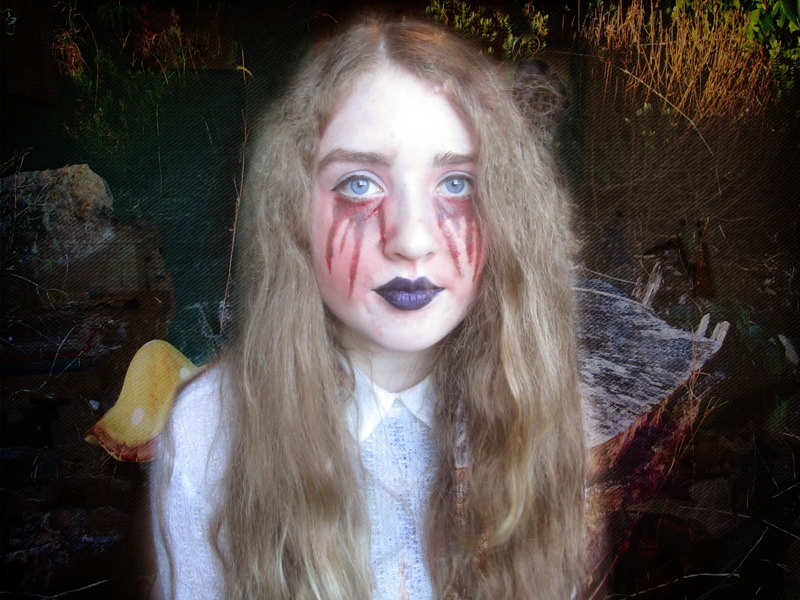 Obviously our character isn't happy, because if she was, then it would be an entirely different story which would take the fun and spookiness out of this look which is the objective ! As always, I did film a video for this tutorial which you can watch here but for now, here are the written steps. 1. I first used a grey eye shadow and applied it over my eyelids. Then I contoured my cheekbones, temples and down the sides of my nose which created an overall colder tone so I didn't need to use white face paint or anything. 2. I then went back to the eyes and for the entire look, I was using a duo blush as always so I began applying the lighter shade from the outer crease to where the inner corner meets my nose. I also applied some blush under my lower lashline only to realise this wasn't need because of the fake blood, but if you're skipping the blood, this is a quite handy for any vampire look. Next comes the best part - fake blood ! This was my first time using the blood this year and i's from a different shop to last year (Tesco if you must know.) which meant I was apprehensive about using it but it ended up being better than last year so win for all ! 3. So we're creating running tear shapes with our fake blood and the best way I can describe the application is thick wonky lines which also resemble skinny triangles. I began these lines below my under eye circles that I literally just covered in blood. 4. 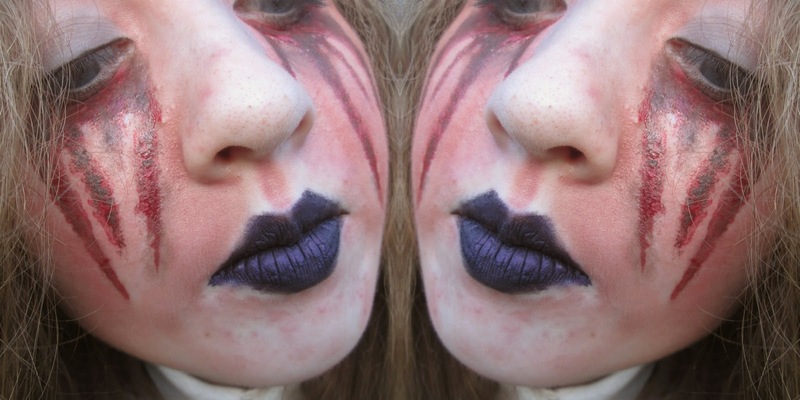 Whilst waiting for the fake blood to dry, I used a dark purple gel eyeliner on my lips. This obviously isn't a brilliant idea so if do actually own or have access to a purple or black lipstick, use that over eyeliner ! 5. Fake blood is always quite neon and doesn't look natural at all and I wanted to create the illusion that it's been lying there for a while or almost dried in so I took a dark burgundy-brown and dabbed it over the tears. The majority of the fake blood I used to use, would peel off when I did this step, but it actually didn't this time so I was just like *cóisír*. 6. Even if the tears weren't bloody, my face would be quite swollen so I used the lighter shade of blush again around the blood tears and then the darker shade around the edges. I must admit that I went a tad bit too far with the swollen effects so I ended up adding blush to random areas of my face too. 7. Finally, if you need to redo any of the fake blood, may that be your finishing touch ! I have no idea what Halloween look to do next - I'm think crazy colour contouring and skulls, so tell me what you think.